← New Edible South Florida Issue is out! Many gardeners jump right into gardening without a clear plan for their garden. This can be ok for some, and beginner’s luck is a phenomenon that exists in certain gardening situations, but by and large it is helpful to generate some sort of plan, even if it isn’t a plan executed at once. 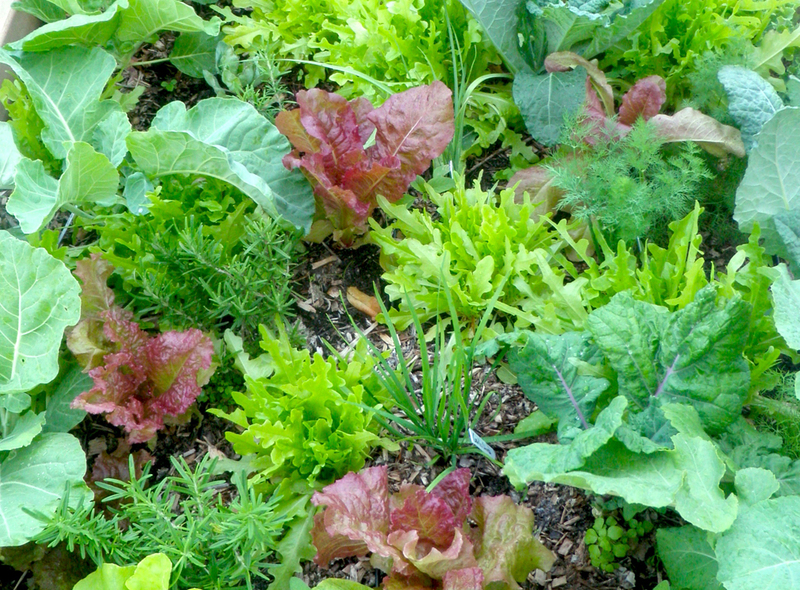 Developing the right plan for your edible garden depends on the amount of space (soil, sun exposure, proximity to kitchen, etc) and the amount of work that you want to invest into its installation and maintenance. Summer is an excellent time to improve your soil and have it ready for fall planting. I recommend doing this by adding compost, mulch and planting cover crops like buckwheat, sunn hemp and pigeon pea. Also, summer is the best time to plant fruit trees, so if you want to include fruit trees in your edible landscape consider planting them while we have the rain and warmth of our summer weather. Consider having a your bed(s) for annual vegetables and herbs in an area close to your kitchen door, or for those of you with shady backyards but sun up front, consider having a garden close to your front door. Placing your veggie/herb bed(s) in areas that you’ll see on a daily basis will result in you using your garden more, as well as taking better care of it. Also, having your garden in front makes your garden into more of a social experience, and can lead to other neighbors gardening more and having great produce trades. For everyone who goes out of town on a regular basis, or just doesn’t have the time to water their garden sufficiently, it can be wise to consider having an irrigation system, particularly for your annual bed. Systems of drip lines and micro-sprayers are particularly water-wise for annual garden beds. Setting up rainwater collection systems are also well worth considering. Having an irrigation system ready for the dry part of the year in late fall-early spring will generally make your garden more productive, especially in planted areas that receive full sun for most of the day. Both under-watering and over-watering gardens can lead to unhappy plants. Irrigation systems can help provide regularity to your watering schedule. For those that don’t have yards, we recommend growing in pots or planters. Ready-to-Grow offers “Mini-Gardens” or small raised beds with bottoms that can be easily fit onto balconies. 1. Edible plants can be planted directly in the ground (ideally with improved soil) or in raised beds (usually made out of wood or stone). Since the soil in south florida is usually sandy and rocky, it is best to improve its nutritional value through the addition of compost and organic fertilizers. Remember to prepare your garden site in an area that receives ample sun exposure and close to a water source. 2. Edible plants can be planted from seed or from plants that are already started in pots or seedling trays. I recommend starting plants from seed directly in the garden for larger seeded crops like beans and cucumber. If starting plants in pots or seedling trays it is best to use a fine mix that is both rich and well draining. Keeping the soil moist is important for starting seeds, but overwatering can injure or kill seedings. 3. Remember to provide a trellis to plants that need additional support, like vining beans and tomatoes. 4. Mulching on top of soil will help to prevent the growth of weeds, and keep the soil moist. Just remember to not put too much mulch, especially around small plants. Generally the larger the plant, the more mulch it will prefer. 1. Different plants have different watering requirements. Generally plants that are just planted require watering once or twice a day until they are more established. If plant leave are droopy and soil is dry 1-2″ below the surface, it is probably a good time to water. 2. Regular harvesting is very important once plants become larger. Without it, it is easy for a garden to become overgrown. Also, tomatoes can be tied to trellises to encourage more vertical growth and conserve space. 3. Occasionally adding compost, mulch and/or organic fertilizer can help. If pests become problematic there are different organic pesticides that can be used. This entry was posted in Edible Garden News and tagged 8' x 4' raised garden bed, arquitectonica, arquitectonica garden, balcony raised bed, build raised bed, building a vegetable garden, building raised beds, building raised garden, coconut grove landscaping, collecting rainwater, community gardens in south florida, community gardens Miami, Dylan terry Miami, Dylan terry ready to grow, edible gardens florida, edible landscape designer, edible landscaping, Edible perennials, Edible plants in South Florida, edible school gardens, everglades tomato, Fairchild Tropical Garden, florida edible plants, garden boxes, garden kits, greenheart 4 x 8, growing bananas in south florida, Growing vegetables in South Florida, Heat tolerant vegetables, herb gardening, Hot weather edible gardens, how to build a garden, how to build a raised garden, how to grow an edible garden in south florida, how to raised garden bed, irrigation for gardens, low maintenance florida garden fruits vegetables, make raised garden bed, Miami herb garden, Miami Permaculture, miamiediblegardens.com, Organic garden company south florida, Organic gardens Miami, organic vegetable maintenance florida, Permaculture for south florida, planting vegetable garden, Rain barrels Miami, Rain barrels south florida, rainwater harvesting, raised bed kits, raised beds service, raised garden beds plans, raised garden designs, raised garden ideas, raised planter, ready to grow gardens, Ready-to-Grow Gardens Miami, reclaimed wood, Slow Food Miami, south florida edible landscaping, south florida edible plants, South Florida herbs, south florida raised bed gardens, tropical fruit trees, vegetable garden designs, vegetable garden planning, vegetable garden plants, vegetable gardening in raised beds, Vegetable plants in Miami Organic vegetable garden, Veggie garden, where can i get compost in Miami, where to buy herb plants in miami florida, wood for raised garden beds. Bookmark the permalink.